Hello Sir, Please kindly help me.. I can’t open the page which i was usually visit to download music, it goes “Its seems error occured” Possibly reason: this site is temporary unavailable. Please try it later. I tried troubleshooting some simple techiques by clearing cache and so on, and even changing the URL. But nothings happened, im still facing same problem. Please help me. Thank you.. 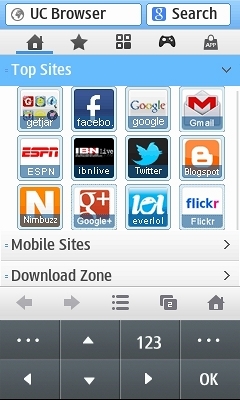 The UC Browser is available from the Google Play Store ( UC Browser – Google Play ). Unless your country blocks Google or your device doesn’t support the Play Store there’s no reason to risk getting malware by downloading UC from a 3rd party app store. Go to http://www.ucweb.com/ucbrowser/download/ with the phone browser to download the best version for your phone. It doesn’t look like the Gionee L700 is a touchscreen phone so there’s no reason to use one of the customized versions on this page. 7.2 Lite is the latest version of UC Browser that’s under 200 KB. but by mistake it got deleted..
pls give me uc 8.5 w/o virtual keypad jar link, bcos jad file is showing illegal java authorisation error ! The Samsung SN-B360E not a touch screen phone. The unmodified version of UC Browser from http://wap.ucweb.com should work. http://www.operamini.com/help?version4.5 with your desktop browser or contact your service provider for Internet setting. That message means Opera Mini can’t connect to its server. There are many possible causes. See Solving Opera Mini and UC Browser Connection Problems for troubleshooting tips. my LG370 couldn’t download this application please help me aut. The LG 370 is not a touchscreen phone so you don’t need this version. 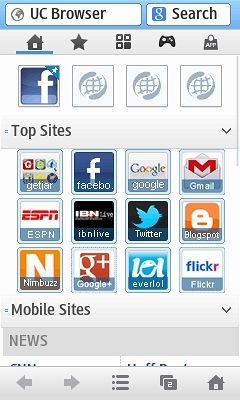 Try downloading UC Browser directly from UC by visiting wap.ucweb.com using your phone’s built in browser. and type of change do i do on it. MANIFEST.MF is a text file in the META-INF folder in the jar file. I already told you what you need to change in that file. after putting this code in MANIFEST.MF on my own uc 9.5.jar. and after moding it. when my 9.5 install gets completed on my nokia 5130. why is showing invaild application. You can’t modify the jar file of a signed app without breaking it. When working with signed apps you can only modify the jad. then sir how do i break signed apps for jar files? sir i had also done with the jad file. Does the jad I made work? If it does compare it with your jad to see what’s different. yes that jad file worked on my n5130. sir can you post some MANIFEST.MF for non touchscreen mobile cell phones? The jad files should work on touch and non-touch screen phones. I don’t mess with MANIFEST.MF. More trouble than it’s worth. Everything I want to do can be done in the .jad. and sir one thing how do i change exe of files from pc? What do you mean? An exe is a Windows app. You can’t change it to anything else. i mean how do change it. how do mode my uc .jar file? means how do i change its class,name,logo etc from my pc? Open the jar with 7-Zip. Open META-INF/MANIFEST.MF with a text editor. Change the name (MIDlet-Name). Logo will be the .png file listed on the MIDlet-1: Save MANIFEST.MF. Replace the logo .png file with yours. In the 7-ZIp File menu Close the jar. What phone (make and model) are you using and what happens (error messages etc.) when you try to install the app? Install KEmulator on your PC and use it to launch the UC Browser jar file. hello…my phone is samsung gt s8600 and the download link all of them shows the error message ie. certificate error expired.. pls hlp me…. This application is also fullscreen no my samsung gt-s5222. Happy New Year to you Sir!!!! Can you please make a handler uc browser to a signed version. When you modify an app’s jar file, which Handler does, the signature is no longer valid and the app needs to be resigned. To be able to sign apps you need to be able to convince the signing authority that you created the app and pay a fee of about $500/year. Neither I or Handler created UC browser so neither of use can get a signing certificate even if we were willing to pay. OMG THANK YOU SO MUCH FOR DOING THIS. It means so much to a guy who owns an LG 840g with that stupid fat 100-pixel arrow board covering everything up. ma mibile is samsung gt-c3222, i have already used uc browser jaba 9.1 successfully before few months but as on today if i download any version of java say 9.1 or 9.2 then, it show testing network error and many times its it starts the “Testing Netwok” but never finishes and i forcefully have to cancel it everytime ….. Please on my uc browser for blackberry ; it keeps saying error when I click on download for something . Please can you do something about that , ’cause it is really frustrating . The UC Browser versions on this page are not intended for BlackBerrys and will not work properly on them. Download the BlacKBerry version of UC Browser by visiting wap.ucweb.com with the BlackBerry’s built in browser. For help with the UC Browser for BlackBerry visit the UC Browser Forum’s BlacKBerry section. @Dennis..I’m using a blackberry curve 9320 ..is there any update for my phone coz I currently have uc browser 8.1 version ..when I try 2 install any version from the post..I get an erro….as it about to install.. I’m not happy with my downloading speed ..12kb maximum..
You need to use a Blackberry version of UC Browser. Get it at http://wap.ucweb.com using the phone’s browser. Try downloading from http://wap.ucweb.com using the phone browser. If that doesn’t work, report the issue on the UC Browser forum. Follow the instructions in the post to modify the Handler jad files to remove the virtual keyboard. After u install this all java files wi work …. U will have to download this from a local android market…..
There’s also UC Browser Mini in the Play Store, https://play.google.com/store/apps/details?id=com.uc.browser.en which works just like UC Browser for Java ME. I want to know if we can edit any java app the same to make it comfortable for us.